Alex Alexander - Rocktopia – On Tour This Spring! Alex is a “first call” session drummer/percussionist residing in New York City who is the first on the list of talented drummers when a producer or musician needs a drummer who will bring a solid performance and incredible creativity to a project. He has performed and recorded with many artists, including David Bowie, Dido, Eminem, Ritchie Blackmore, Rickie Lee Jones, Jimmy Cliff, Youssou N’Dour, Joy Askew, Bernie Worrell from P-Funk, Bruce Springsteen, The Association, Toots and the Maytalls, Sophie B. Hawkins, J.C. Chasez from NSYNC, Montell Jordan, Willie Nile, Dougie Fresh, Bebel Gilberto, Julia Fordham, The Barrio Boyzz, Eljuri, Chaka Kahn, Buddy Miles, and many, many more. 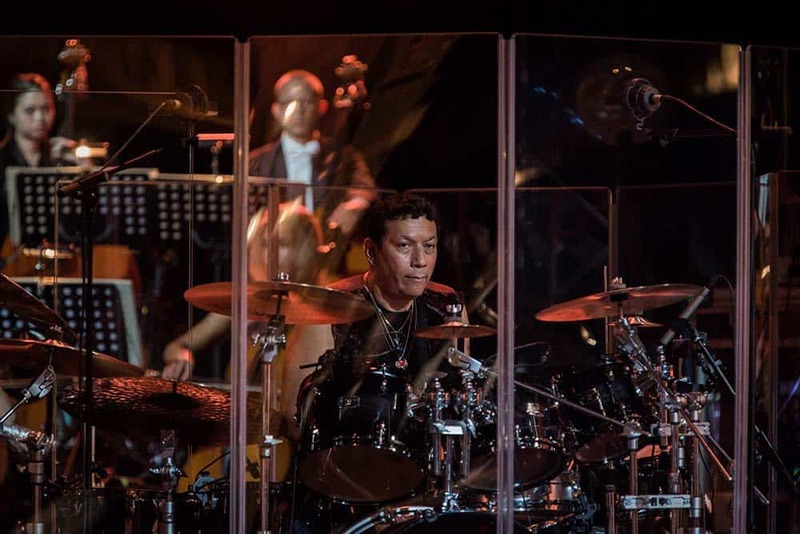 In addition to his mastery of the drum set, Alex plays all world percussion instruments and has the uncanny ability to play all styles of music authentically, including rock, pop, metal, funk, hip-hop, Latin, country, jazz, and many more styles. He has also offered accompaniment to singer-songwriters and other solo artists. Alex has invented an instrument called the Electric Djembe. Using African djembes, ethnic percussion, Shure wireless microphones, and custom Guitar F-X pedals and loop boxes, Alex creates sounds that range from drum machine emulation to ambient keyboard pads and washes. These sounds are perfect for everything from singer/songwriter trios to movie soundtracks. These are totally analog organic sounds that have never been heard before and create a terrific atmospheric vibe. His unique blend of hand percussion and guitar effects pedals can be heard on television and film soundtracks, which he composes through his production company, Perpetual Motion Productions. Alex is endorsed by Zildjian Cymbals, Vic Firth Sticks, Brady Snares, Protection Racket Cases, Remo Drumheads, Magbana Djembes, Shure Wireless Systems, Roland and Boss FX Pedals, Digitech Customized Pedalboards, Logic Audio software, Apple computers, ibo Udus, RhythmTech Percussion, HipTrix Glow products and he absolutely loves Yamaha Drums. Visit Alex’s website to learn more about him, and check for upcoming Rocktopia tour dates to find out when Alex and the rest of the incredible Rocktopians are coming to your town!